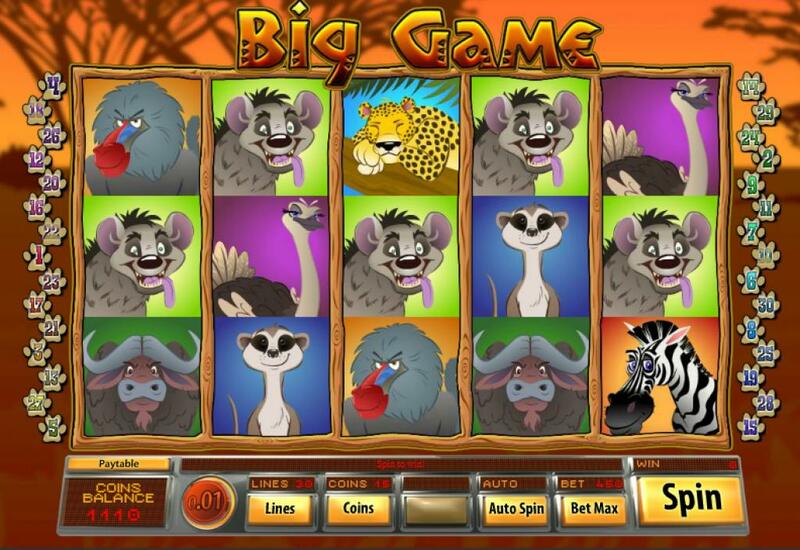 Big Game is a Safari themed slot machine, and that’s all you’re going to see on the reels of the game. It’s filled with symbols which represent various wild animals that might be seen during a Safari or a visit to Africa’s jungles. 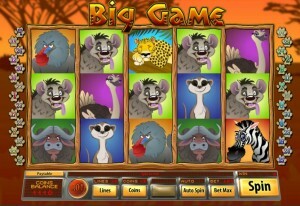 From hyenas, to ostriches, monkeys or zebras, the game tries to cover as many of these animals as possible, without relying on poker cards or other images that are not connected with the theme. As for the developer behind the game, it’s called Saucify. 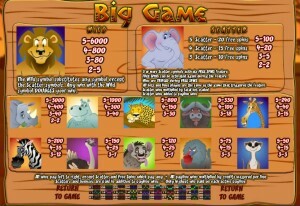 Big Game is a modern title, which offers 5 reels and 30 bet lines. It also has free spins, 3x multipliers, a scatter and a wild. The 6,000x top jackpot has a value of $9,000. The two standard features offered in modern games are the wild and the scatter. They’re both present in this game, and they can bring you multipliers and free spins. First of all, we have the wild, the image chosen for it being a logical one, showing us the Lion, the king of the jungle. Have the Lion as a substitute in one of the regular combinations that get formed, and you will win twice as much, thanks to the 2x multiplier which it applies when it is of assistance. The Lion can just as easily form its own combo though, provided that you’re lucky enough to get between two and five of them on a payline and from left to right. It will pay up to 6,000x if that happens. The other symbol is the scatter, which both pays well and triggers free spins, so it’s a favorite of mine. 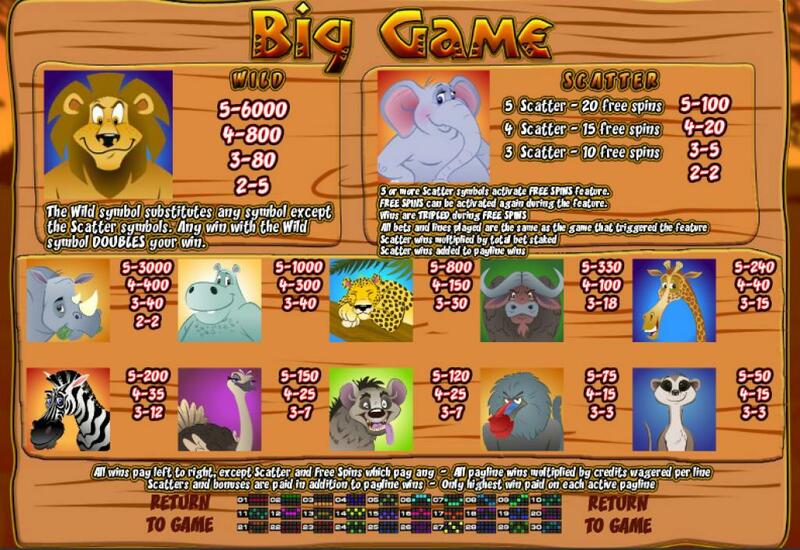 Have two or more Elephant scatters on the reels, anywhere on them, and you will receive a prize valued at 2x to 100x the wager. 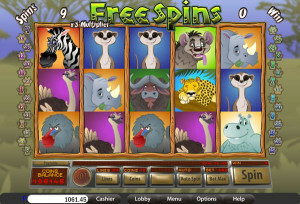 With enough Elephant scatters on the reels of the game, you can expect to win free spins, between 10 and 20 rounds that you don’t have to pay for. You get wins along the way which are tripled in value, so multiply any payout from the paytable by 3x to find out how much you can win inside. With a bit of luck, retriggering the free spins is allowed. The game will use coins of only $0.10 when they’re at their highest, but it will also allow you to use up to 15 of them for each payline. You end up with wagers of up to 450 coins this way, with a value of $45. If you get the top jackpot, meaning that you’ve landed five Lion wilds on a payline, you get 6,000x the line bet as a prize. The maximum value of the resulting 90,000 coins would be $9,000 at best. You only see wildlife on the reels of this game, the setting being the African savannah. You see a bit of Africa behind the reels, but the image is not a very clear one. The focus remains on the reels encased in wood, on which you get a dozen different creatures that inhabit this continent. They’re well designed, in cartoon style, but mostly smiling at you. I appreciated the lack of poker cards among the symbols, it’s not always that you get a slot that is so dedicated to its theme. Symbols: Lion (6,000x, wild), Elephant (scatter, 100x wager), Rhino (3,000x), Hippo (1,000x), Leopard (800x), Buffalo (330x), Giraffe (240x), Zebra (200x), Ostrich (150x), Hyena (120x), Baboon (75x) and Meerkat (50x). I’ve enjoyed the game, mostly because it doesn’t compromise and it only focuses on safari animals, not giving you a single symbol with a different type of image on it. The features and the rest of it aren’t bad either. You will find Big Game at any online casino which chooses to use software from Saucify, playable either for free or for real money.